This is a detailed record on how the Marlin framework and included LCFIVertex packages are used for jet flavour tagging. b-jet flavour tagging is part of our analysis of the feasibility of the ZZ fusion channel with CLIC ILD at 1.4 TeV. Note: this wiki refers to the LCFIVertex package, that can be found now on GitHub here . 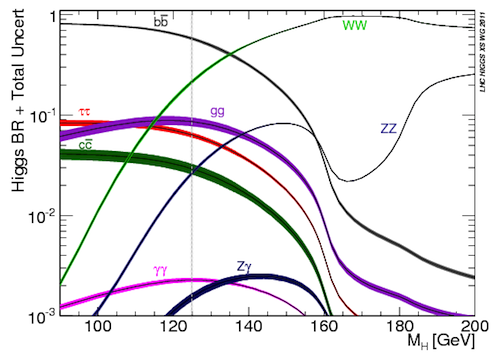 The LCFI package consists of a topological vertex finder ZVTOP, which reconstructs secondary interactions, and a multivariate classifier which combines several jet-related variables to tag bottom, charm, and light quark jets (see diagram). The JetFinder processor reconstructs 2 and 4 jets events from the input collection (LooseSelectedPandoraPFANewPFOs was used). For the reconstructed 4 jets, MyTrueAngularJetFlavourProcessor determines MC Jet Flavour by angular matching of heavy quarks to jets, and also determines hadronic and partonic charge of the jet. The LCIOOutput processor creates new slcio files containing the new collections added by the above processors. IPRPCut	- selects Reconstructed Particles based on track parameters, number of hits etc. Our input slcio files contain the collections: LooseSelectedPandoraPFANewPFOs, MCParticlesSkimmed, PandoraPFANewClusters, PandoraPFANewPFOs, PandoraPFANewReclusterMonitoring, ProngVertices, RecoMCTruthLink, SelectedLDCTracks, SelectedPandoraPFANewPFOs, TightSelectedPandoraPFANewPFOs and V0Vertices. The processors listed above could be run in sequence, or split in several steps, invoking a LCIOOutput processor to write intermediate slcio outputs at every step. Here's a script for that, where the intermediate xml files are slight modifications of the files provided in LCFIVertex/steering examples. We found that the most time-consuming processor is ZVTOP_ZVRES with more than 10 s/event. We found it easier to run processors 1 to 6 on batches of 10 input files, and save the outputs as /afs/phas.gla.ac.uk/data/ilc/datasets01/1.4tev/ZVRES_out/runX_out.slcio. Then we ran processors 7 and 8 on these files to produce a new set ftiX_out.slcio. 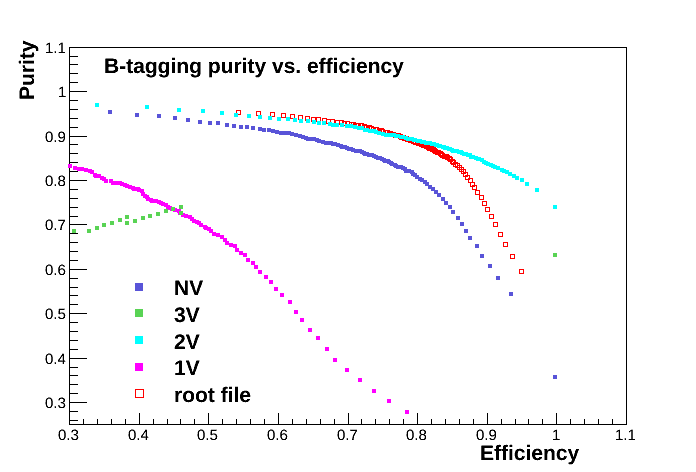 We used half of these files to train the neural net, but then again was easier to run flavour tagging (see below) on the individual ftiX_out.slcio files. 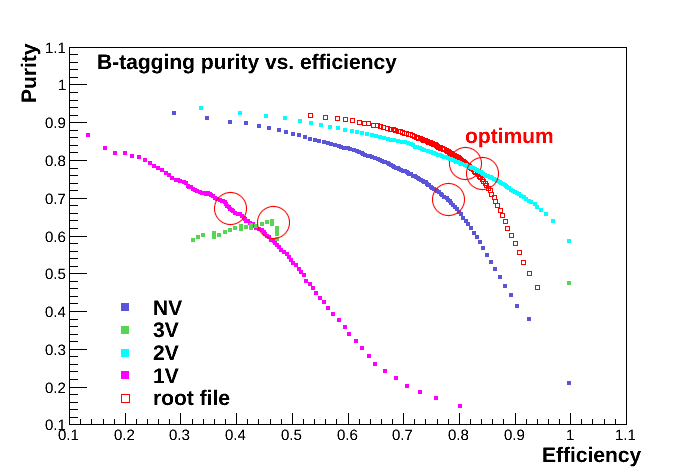 We used the other half of the files files for the purity vs. efficiency plots (see below). These slcio output files were stored in /afs/phas.gla.ac.uk/data/ilc/datasets01/1.4tev/ZVRES_out/ as well. Troubleshooting: The b3_D0CutValue parameter of the IPRPCutProcessor was set to 5O instead of 50, and was causing a crash. For the ZVRESRPCut processor, h1_MCPIDEnable had to be set to false. See also this post . 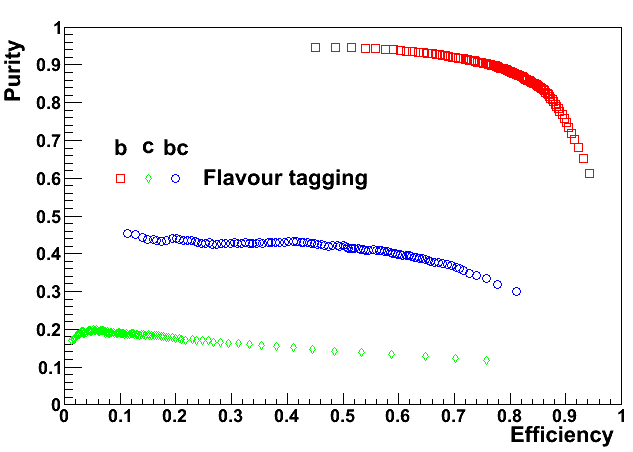 Now we are ready to employ the FlavourTag processor, which will do flavour tagging using the neural nets trained in the previous step. The input slcio files contain the FlavourTagInputs and FTSelectedJets (or Durham_4Jets, not sure if there's a difference at this level) collections. The output slcio will contain a new collection FlavourTag (or FlavourTagGla in our customised configuration). to the LCFIVertex/CMakeLists.txt file, sourced the root environment, then ran cmake and make install. 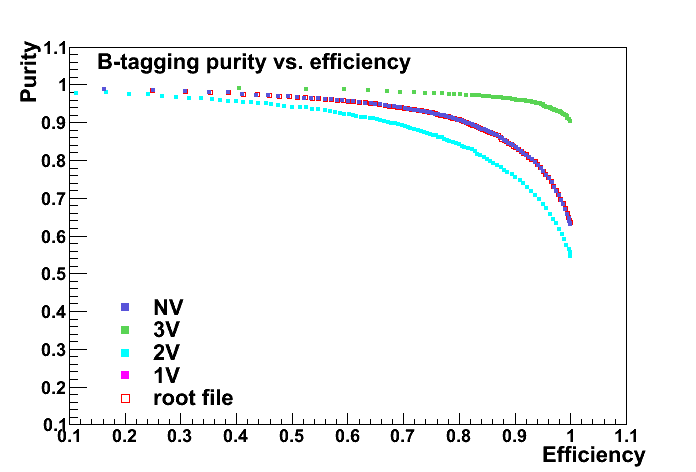 The cut values and corresponding purity and efficiencies are tabulated in the file PurityEfficiencyOutput.txt. 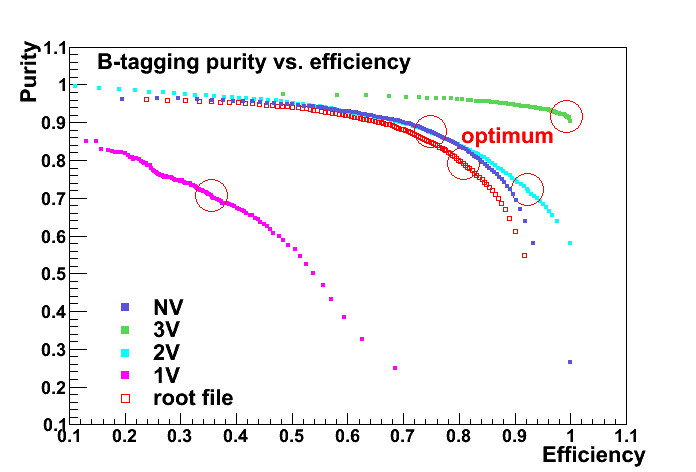 We used another Root macro to plot these values and determine the optimum b-cut. We had to run processors 1-7 on these files to identify jets and calculate the discriminating parameters. For this, we used slightly modified versions of the scripts, which can be found here. The resulting outputs, containing approximately 25k events, are stored in /afs/phas.gla.ac.uk/data/ilc/datasets01/1.4tev/ZVRES_out/ as well. We have trained another set of neural nets but adding this time eeqq background to the input. The resulting neural nets (25k signal + 25k background) are here: bnets.tgz. The relevant scripts and XML templates are here. The outputs are stored in /afs/phas.gla.ac.uk/data/ilc/datasets01/1.4tev/ZVRES_out/ and have the prefix kt added the file name.